At whom are you pointing your finger? Everyday you read it, see it or hear it … someone pointing the finger at the ‘other guy’. So and so did it, it’s someone elses fault. The old saying is, when you point the finger there are three others pointing back at you. Everyone is to blame, and no one is to blame. No one wants to take credit for the bad, no one wants to be at fault. We are a NO FAULT generation. Christians are no better, they love to point fingers. “No wonder what they are going through, did you know that …?” and so the gossip goes. Gossiping, that’s another blog. 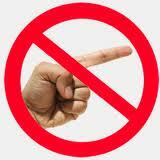 Pointing the finger, you cannot go to church or be in a gathering of Christians without hearing people pointing the finger. Recently someone a few towns over won $600 million in the lottery. I heard so many comments from Christians. “Better not have been a Christian, unless they found it in the parking lot!” Amazing what people single out. So many play the $.44 cent lottery (cost of stamp to mail in an entry to win millions in a contest). Others ‘gamble’ on the stock market. Gambling’s a sin, right? Depend on how much you spend? What about that $1.29 candy bar at the check out? Gluttony’s a sin right? Depends on if you’re overweight? That soft drink? That movie? What about that latte? We just LOVE to point our fingers at everyone elses lifestyle. The only judgement comes from God’s word. Let Him be the judge. I was walking in the parking lot and I heard the most profane comments, including the Lord’s name linked to profanity. The voice was young. I stopped and turned around. Three girls and a boy were walking behind me; none over 15 years of age. I looked at the girl with profanity flying off her lips and wanted to tell her how pretty she was … until she opened her mouth. Her words made her ugly. Not cool, cute or popular. They made her ugly. 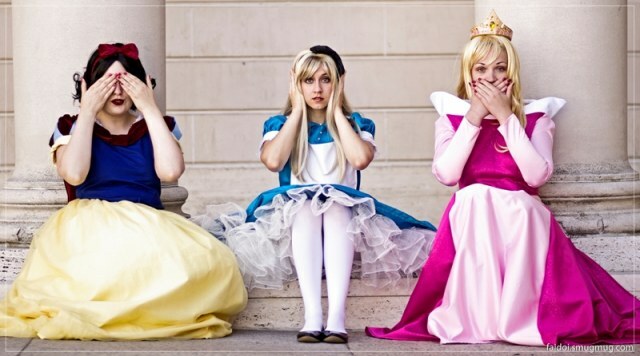 You can dress up like a princess all day long, but one flow of inappropriate words will destroy that image. The woman pushing the cart in front of me was on her phone talking loudly. “Now this is between just you and me. But, she ….”. Really? There were about ten others in earshot listening to her gossip. If she had been quietly shopping others would have thought her to be a diligent mom out shopping to feed her family. Her words made her a gossip and she spewed hurt and shame on an unsuspecting audience that may or may not know her victim. “The tongue also is a fire, a world of evil among the parts of the body. It corrupts the whole body, sets the whole course of one’s life on fire, and is itself set on fire by hell.” (You should read all of James 3:1-9). God expects us as parents to make sure our children hear the correct things to say. The shows, video games, computer games that they watch, influence their speech. In our house I did not allow my girls to call each other stupid, idiot, jerk or other demeaning terms. We do not say shut up. Speech is important to developing a Godly character. Sadly, some parents think it is not anything to worry about. However, speech is a sign of respect. God thinks a lot about the words we say. The verses above are only a sampling of how He wants us to guard our speech. If we are not guarding our speech then we are not guarding their speech; we are not guarding their minds. If we are not guarding their minds, we are not guarding their souls. What they think to say becomes their speech. Their speech reflects in their actions, their actions in their character. It all starts with a word … then more words.